Candlesticks should provide different visual cues that make understanding price action easier. Time-frame trading with Japanese candlestick charts allows traders to understand market sentiment better. Thanks to Steve Nison, candlestick charts offer a greater depth of information than traditional bar charts. 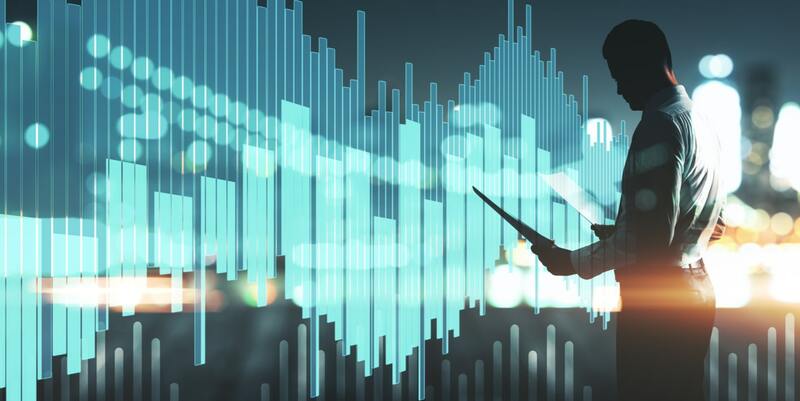 On bar charts, highs and lows are emphasised more than anything else, while Japanese candlesticks place emphasis on the relationship between the open price and the close price. Candlestick charting provides traders with a detailed depiction of a price graph, with an almost three-dimensional effect. What stands out most is that a chartist can see patterns more clearly and distinctly compared with other types of charts. 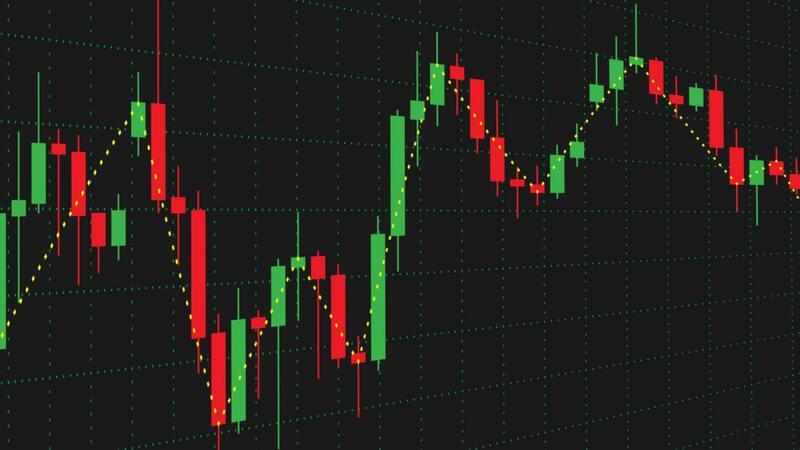 Traders who use different candlestick patterns should identify different types of price action that tend to predict reversals, or the continuations of trends. 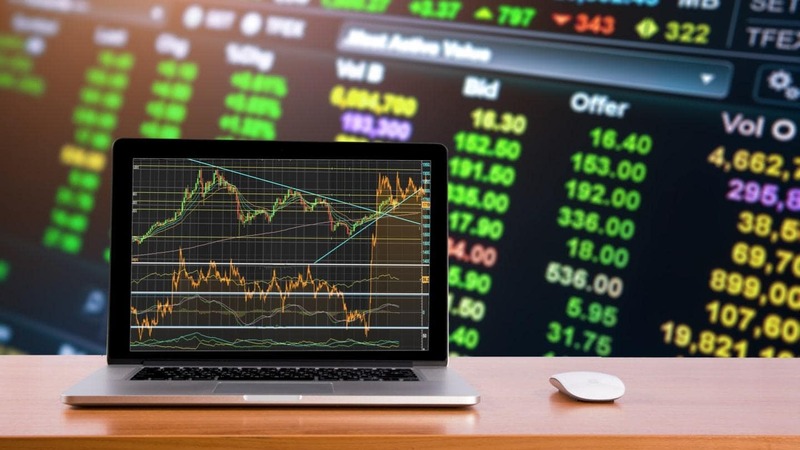 Additionally, when we combine them with other technical analysis tools, we should get an accurate estimate of possible price movements. 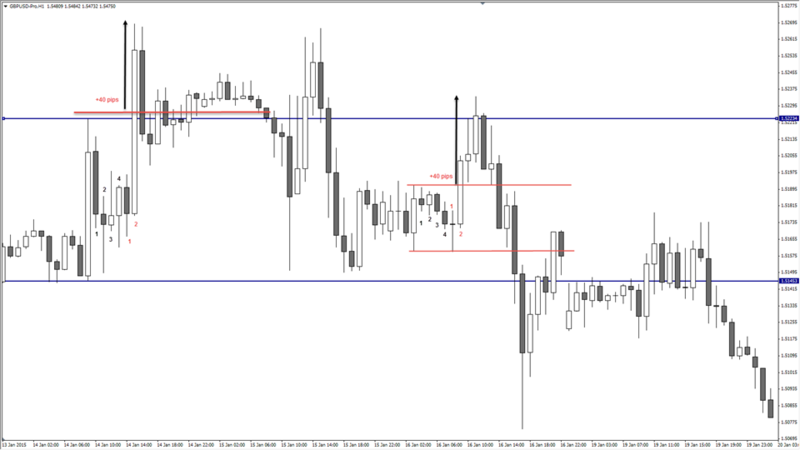 As we can see from the image above, a price closing higher than where it opened will produce a white candle (bullish). A price closing lower than where it opened creates a black candle (bearish). The boxes that are formed by price action are called 'the body'. The extremes of the daily price movement which are represented by lines extending from the body are called the tail (wick or shadow). The small part of the candle that is left behind is called the nose. A price closing where it opened, or very close to where it opened, is called a Doji. Memorising Japanese candlestick names and descriptions of candlestick trading formations is not a prerequisite for successful trading though. Nevertheless, it is helpful for every price action trader. By looking at candlesticks, traders can see momentum, direction, now-moment buyers or sellers, and general market bias. Source: EURUSD H4 Chart - Admiral Markets Platform - Data Range: Jun 26, 2017 - Aug 4, 2017 - Please Note: Past performance does not indicate future results, nor is it a reliable indicator of future performance. The candle is a kind of measure from its high to its low. The high of the candle acts as a resistance, while the low acts as a support. The bigger the candle, the stronger the levels of support and resistance are (especially during Master Candle Trading – see paragraph below). Source: AUDUSD H1 Chart - Admiral Markets Platform - Data Range: Aug 3, 2017 - Aug 7, 2017 - Please Note: Past performance does not indicate future results, nor is it a reliable indicator of future performance. The window to your left – the data window – shows you the crucial candlestick data you need to know, including the high and low, as well as the open and close price. This is the default data in the MetaTrader 4 (MT4) platform. Source: EURUSD H4 chart - Admiral Markets Platform - Data Range: Feb 23, 2017 - Apr 7, 2017 - Please Note: Past performance does not indicate future results, nor is it a reliable indicator of future performance. As the coloured body of the candle represents either a positive or a negative reading during uptrends, or in bullish market conditions, buying will usually occur on the open. The price should rise, and a hollow, white candle is formed. As the bulls control the price action in the market, the length, or the distance between the open and the close reflects their dominance. In bearish market conditions, or during a strong downtrend, a dark body candle should form. This represents sellers entering the market on the open, and dominating that particular time. Candlestick charts allow for great analyses from the shape and colour of the body of the candle, in comparison with bar charts. The length of the wick represents the price low and/or high, when comparing with the open and close prices shown in the real body of the candle, which can also illustrate the market's denial of a support or a resistance level. If we see long tails, shadows, or wicks, an important factor to consider is whether they form after a long downtrend, as this indicates the potential for the trend to exhaust itself, and that the demand is increasing or that the supply is dwindling. If we have tails, shadows, or wicks formed at the tops of real bodies, especially after a long price rise, this indicates that the demand is drying up, and that the supply is increasing. The larger the shadow, the more important it is to analyse it in relation to the real body, as this may signify the strength of the reversal. The strongest of those are pins. In the image above, the Bullish pin bar's tail is pinning down, rejecting support. This is Indicated by the bullish "pin", thereafter, and we would see a surge of 'now-moment buyers', and, consequently, the price would increase. Conversely, when a bearish pin bar's tail is pinning up, and rejecting resistance, we would see a surge of 'now-moment sellers', and the price usually decreases in this instance. The strongest reversal candles have wicks that are much longer than the bodies, and a very small nose, or simply no nose at all. Source: GBPJPY H4 Chart - Admiral Markets Platform - Data Range: Feb 6, 2017 - Mar 21, 2017 - Please Note: Past performance does not indicate future results, nor is it a reliable indicator of future performance. Strong momentum candles, which usually open either at a support or a resistance level are called Marubozu candles. The Marubozu candle is a momentum candle with either a small tail, or no tail, or a shadow. 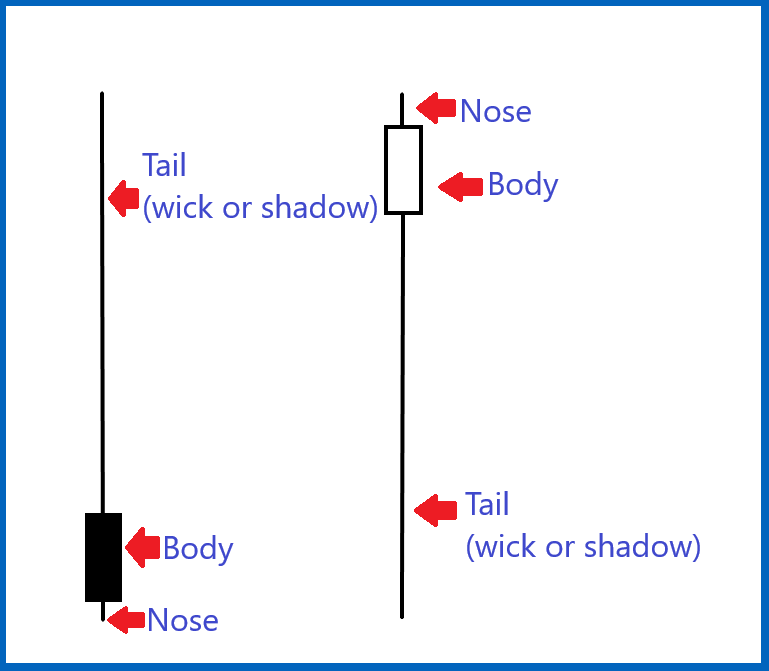 This type of candlestick pattern is really powerful and means a lot in regard to price movement. Marubozu defines a strong selling off resistance or a strong buying off support. Marubozu means 'bald head' or 'shaved head' in Japanese. Source: GBP/JPY H4 Chart - Admiral Markets Platform - Data Range: Jun 1, 2017 - Jun 27, 2017 - Please Note: Past performance does not indicate future results, nor is it a reliable indicator of future performance. Source: GBP/JPY H4 Chart - Admiral Markets Platform - Data Range: Mar 17, 2017 - Apr 7, 2017 - Please Note: Past performance does not indicate future results, nor is it a reliable indicator of future performance. Of course, there are many more patterns. If you would like to learn more about candlestick patterns, why not read our articles on advanced patterns? Source: GBPUSD H4 Chart - Admiral Markets Platform - Data Range: Nov 10, 2017 - Nov 22, 2017 - Please Note: Past performance does not indicate future results, nor is it a reliable indicator of future performance. The Hammer candle has a long lower shadow, which is usually twice the length of the real body. It is a bullish reversal candlestick pattern, usually appearing at the bottom of downtrends. The body can be either bullish or bearish, but it is considered to be stronger if it's bullish. Source: GBP/USD H4 Chart - Admiral Markets Platform - Data Range: Oct 31, 2017 - Nov 10, 2017 - Please Note: Past performance does not indicate future results, nor is it a reliable indicator of future performance. The Shooting Star candle appears in uptrends, signifying a potential reversal. The wick is long, upside, and longer than the body. The body can be either bullish or bearish, but it is considered to be stronger if it's bearish. Source: EUR/USD D1 Chart - Admiral Markets Platform - Data Range: Sep 29, 2009 - Nov 22, 2009 - Please Note: Past performance does not indicate future results, nor is it a reliable indicator of future performance. The Hanging Man candle is similar to the Hammer candle, but it occurs mainly at the top of uptrends, and can act as a warning of a potential downward reversal. Source: EUR/USD D1 Chart - Admiral Markets Platform - Data Range: Oct 22, 2015 - Mar 2, 2016 - Please Note: Past performance does not indicate future results, nor is it a reliable indicator of future performance. The Piercing Line candle is a bullish reversal candlestick pattern. 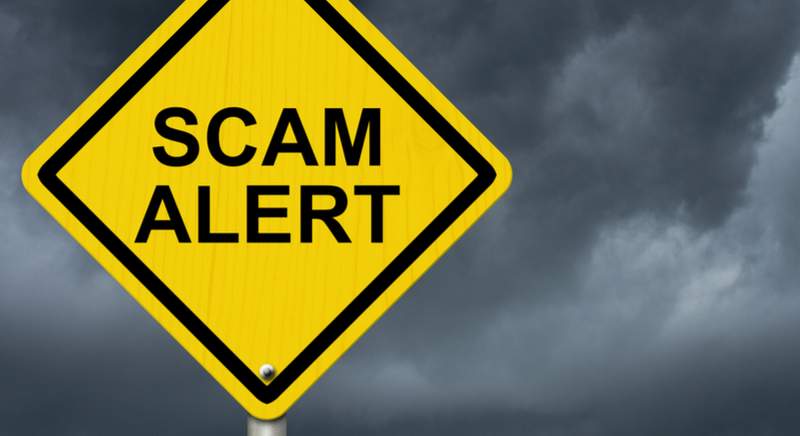 It is very common in the Forex market. This pattern occurs when the second bullish candle closes above the middle of the first bearish candle. The second candle's low is lower than the first candle's low. 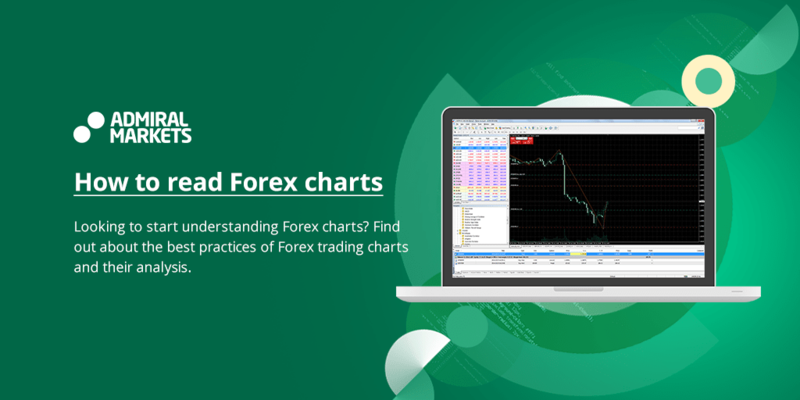 In the Forex market, the pattern is valid even if the second candle's low is equal to the first candle's low. Bullish and bearish engulfing candles are reversal patterns. Bullish candles usually occur at the bottom of a downtrend, while bearish candles are spotted at the top of an uptrend. The Bullish engulfing pattern is characterized by the two candles. The first one is contained within the real body of the second candle, which is always bullish. The Bearish engulfing pattern is also characterized by the two candles. The first one is contained within the real body of the second candle, which is always bearish. Source: EUR/USD H1 Chart - Admiral Markets Platform - Data Range: Jul 10, 2017 - Jul 14, 2017 - Please Note: Past performance does not indicate future results, nor is it a reliable indicator of future performance. Source: GBP/USD H1 Chart - Admiral Markets Platform - Data Range: Jun 28, 2017 - Jul 4, 2017 - Please Note: Past performance does not indicate future results, nor is it a reliable indicator of future performance. Source: AUD/USD H1 Chart - Admiral Markets Platform - Data Range: May 4, 2017 - May 9, 2017 - Please Note: Past performance does not indicate future results, nor is it a reliable indicator of future performance. The Dark Cloud Cover candle is a bearish reversal pattern that shows in uptrends. It consists of two candles. The first one is bullish, and the second one is bearish. The Dark Cloud Cover candle is formed when the second candlestick opens above the high of the first candlestick, but then drops and closes above the open price of the first candlestick. This pattern is the reverse of the Piercing Line. Similarly, in the Forex market, the Dark Cloud Cover candlestick is valid even when the second candlestick opens at the high of the first one. The important thing, however, is that the second candle in this pattern should close somewhere lower than the 50% mark of the first (the bearish candle's real body). Source: AUDUSD H1 Chart - Admiral Markets Platform - Data Range: July 20, 2017 - Aug 1, 2017 - Master Candle Indicator - Please Note: Past performance does not indicate future results, nor is it a reliable indicator of future performance. The Master candle is a concept known to most price action traders. The Master candle is defined by a 30-150 pip candlestick that engulfs the next four candlesticks. The breakouts of the Master candle can be traded if the 5th, 6th, or 7th candlestick break the range in order for a breakout trade to become valid. Source: GBP/USD H1 - Admiral Markets Platform - Data Range: Jan 13, 2015 - 20 Jan, 2015 - Please Note: Past performance does not indicate future results, nor is it a reliable indicator of future performance. Source: NZDUSD H1 - Admiral Markets Platform - Data Range: Jan 2, 2017 - Jan 6, 2017 - Please Note: Past performance does not indicate future results, nor is it a reliable indicator of future performance. This concept is goes in perfect synergy with the Admiral Pivot, for profit taking and placing stop loss orders. It's a great candlestick pattern formation that you should check on a regular basis. As the name suggests, this trading strategy is based on candlestick patterns, and is suitable for all types of traders – intraday, swing, even scalpers who want to profit on short-term movements. First, we need to set up the EMA to correspond to the general trend direction. We also need to install three EMAs on the chart. As shown in the example in the graph below, EMA 20 is blue, EMA 60 is red, and EMA 100 is green. Three EMAs need to be aligned properly in order to show a trend. When the blue EMA is below the red and green EMA, the trend is bearish. When the blue one is above the red and green ones, the trend is bullish. Source: GBP/JPY H4 Chart - Admiral Markets Platform - Data Range: Sep 16, 2016 - Oct 28, 2016 - Please Note: Past performance does not indicate future results, nor is it a reliable indicator of future performance. Source: GBPJPY H4 Chart - Admiral Markets Platform - Data Range: Nov 9, 2016 - Dec 20, 2016 - Please Note: Past performance does not indicate future results, nor is it a reliable indicator of future performance. Please keep in mind that the EMAs need to be aligned correctly in order to show the trend. If the EMAs are intertwining, it means that we don't actually have a trend. Entries are made when the price makes a pullback towards the EMAs. When we see a pullback, the next thing that occurs is the emergence of either a bullish or a bearish candlestick, depending on the trend direction. Entries are made on any of the candlesticks we mentioned above. 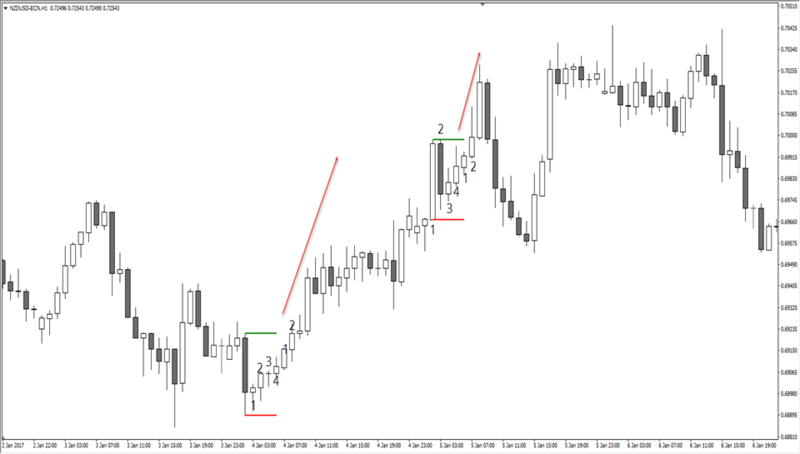 The stop-loss in this example is placed 10 pips above the entry candle. For targets, we recommend using Admiral Pivot set on 'Weekly Timeframe'. Source: GBP/JPY H4 Chart - Admiral Markets Platform - Data Range: Feb 16, 2017 - Mar 30, 2017 - Please Note: Past performance does not indicate future results, nor is it a reliable indicator of future performance. Source: GBP/JPY H4 Chart - Admiral Markets Platform - Data Range: Oct 20, 2017 - Jan 12, 2017 - Please Note: Past performance does not indicate future results, nor is it a reliable indicator of future performance. Tip: It is always best to wait for a pullback to at least touch the blue EMA before making an entry decision. 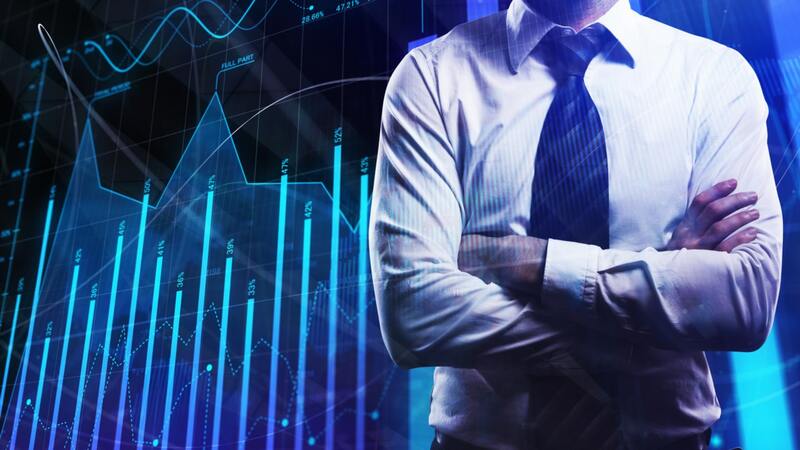 Candlestick trading can be very profitable if you implement risk management within your trading strategies, and effectively manage the risks involved. Always practise on a Demo trading account first before moving to a live trading account. By doing so, you allow yourself to make mistakes and learn within a risk-free trading environment, before you take your strategies into the live markets.